To quote my husband,"let's get back to fun toys and happy occasions." Don't you agree? 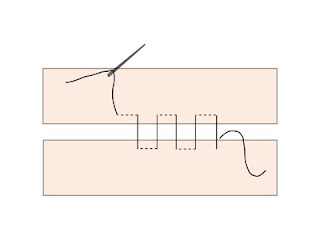 I use a sewing stitch called ladder stitch, which is shown in the diagram below. Ladder stitch: dotted lines show where yarn is going behind fabric. 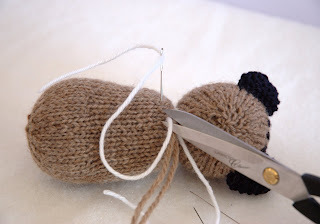 When doing this yourself, you would pull the stitches tight enough for the fabric edges to meet. Head and body stuffed and ready to go. Pin on the head so it stays straight, matching up the back seams (drawn in black). I would usually use those yarn ends from sewing up the body to sew on the head, but I've used white yarn here to make it clearer what I'm doing. 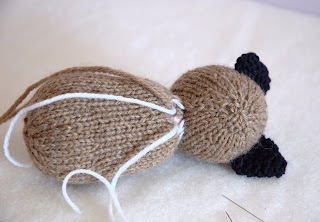 Starting at the back seam, sew the top edge of the body to the head where they meet. I have left the stitches loose so they are easier to see, but you will want to tighten them up so the head is sewn on securely. Here you can see the head half attached. Compare the white stitches to the diagram above if you're not clear on how I'm making the stitches. 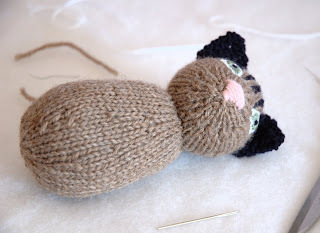 Head sewn on all the way. If the toy is for a young child, I will usually go around a second time. 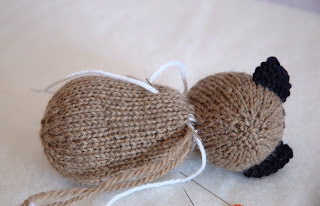 To tidy up the yarn ends, insert the needle a few inches through the body, making sure to exit at a hole in the knit fabric, and pull yarn through. Insert the needle back into body exactly where the yarn exited, and pull yarn through until loop disappears beneath the knitted fabric. 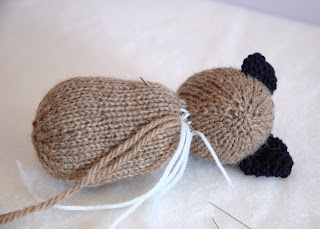 Snip off yarn close to the body, and pull gently at the fabric until the yarn end slips inside and cannot be seen. This method will secure your yarn ends without having to use knots. Repeat for other yarn end. 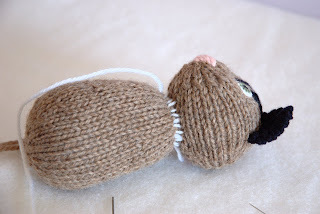 Here you can see the head sewn on with matching yarn. 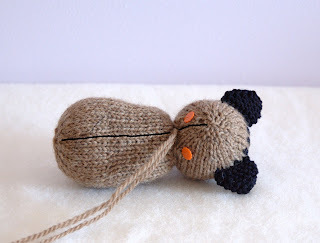 With patience and practice, you can barely see the stitches that hold the head to the body. I hope this was helpful! 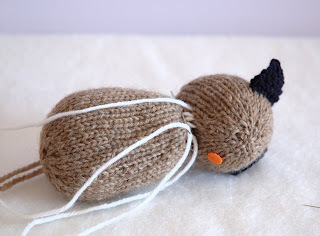 If the pictures aren't clear enough, check the larger sizes on Maybe with some more help I can get other tutorials made. It's a little tricky with just me trying to arrange things and take photos! Posted by Barbara Prime at 4:04 p.m. Thank you for your usefull making up tips. 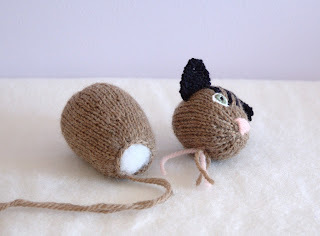 I can knit reasonably well, but my finishing techniques leave a lot to be desired !! I enjoy yours and Julie's blogs -dont let the poor imitators of your patterns get you both down,they will always just be poor imitators. April 10, 2008 at 6:08 p.m.
What an excellent,timely hint. Thank you. I'm still trying to work out shoes for the 'girl' fuzzies. Any ideas or have you covered that already? Feel the same way about poor imitations. Am finding this knitting very good for me! All the Best. April 11, 2008 at 6:22 a.m.